New York Yankees..... 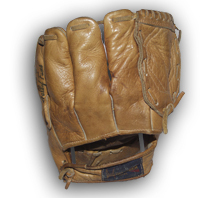 Endorsed 1960s Hollander BaseBall Glove. This is a Jr size. 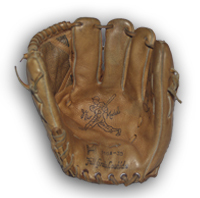 1960s Hollander Brand Little League Youth Size Baseball Glove. Beautiful "Joe DiMaggio" embossed signature on inside of pocket. "The Yankee Clipper Line" embossed on inside of thumb. Nice hard-to-find Youth glove which fits the left hand for a right-handed thrower. Leather is in excellent condition except for some light wear on surface. Smooth leather inner lining is also in excellent condition. Leather laces and leather piping are in intact and in good condition. Collectible Old Vintage Glove, Circa 1960s.